Do you want to see something horrible? I took a four hour spinning class at Loopy, a great local yarn store in the Printer's Row area of Chicago. 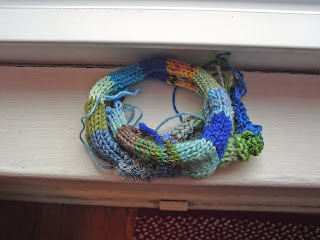 I wrote about Loopy last year when I went on a mini yarn crawl with my friend Linda. The class was great. Meg, my teacher, made me the spindle pictured above and gave me tons of roving to practice on. She took me from rolling a stick along my knee to spindling to spinning and plying on a wheel. She also taught me how to card roving. She made the blue yarn that is plied with the yarn I made above. It's not her fault that the yarn is awful. Now I realize that if I were to practice I could probably make better yarn, even on a spindle. But you know what? In my maturity I begin to see that you don't have to do everything in life. I didn't take to spinning that well. I especially disliked the wheel- spinning posture of leaning forward toward the wheel to feed the draft. I got out of the lessons what I wanted; I learned something about how yarn is made. I am still fascinated with the process of wool and yarn-making though. I am looking at dyeing with natural dyes. I have a little patch in the back of my garden that would be perfect for growing dye plants. I also read a strange and amazing book called Lambs of God by an Australian, Merele Day, about an isolated group of three elderly nuns who organize their days and lives around sheep, fleece, yarn, and knitting. I have also been reading re-told fairy tales about spinning, featuring retellings of the Rumpelstiltskin story. Here is a link to a work blog I contribute to where I posted a review of several of these stories. Now here is something else about Loopy. I went to their Spring yarn tasting. It was fun, but what an incredible marketing tool for them. If you or anyone you know has a yarn store, you must try this technique. As a result of trying out yarn, I bought $70 worth of yarn that I never would have bought otherwise. I am currently knitting with Maizy sock yarn, a soft yarn made out of corn (!) 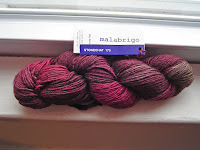 and my first Malabrigo, Silky Merino, pictured here. I am making my third Clapotis with it, to be a smaller, slinkier scarf than the two I already have.